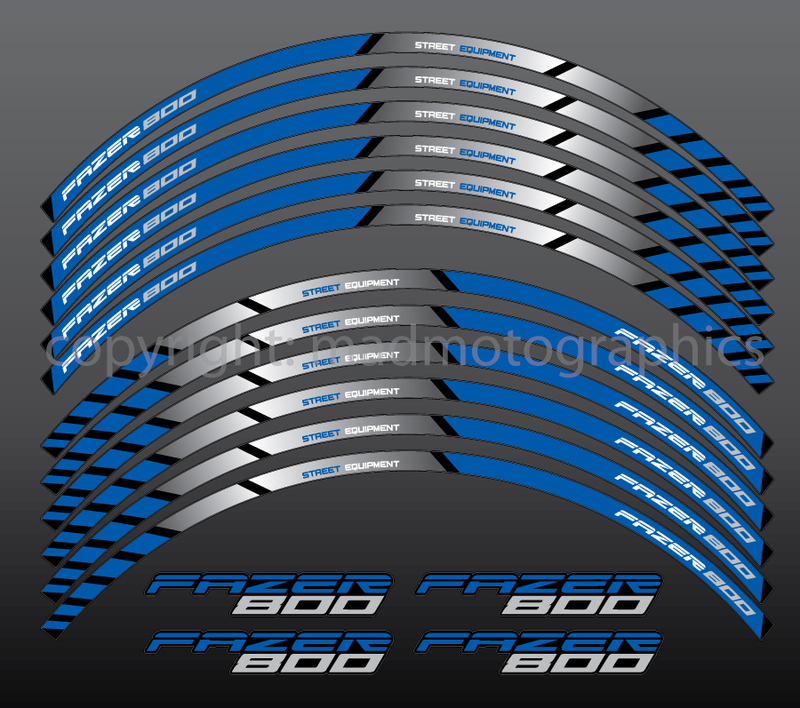 YAMAHA Fazer 800 wheel decals with printed logo full color design - Laminated and protected. The decals are printed using newest and high quality printers Roland, using only original UV inks, insuring deep and perfect quality image. We use only quality outdoor vinyls from world's best brands. Then the decals are laminated with a flexible high gloss laminate to protect the print and color from scratches, dirt, fuel, oil and cleaning fluids and to give them a perfect glossy finish. 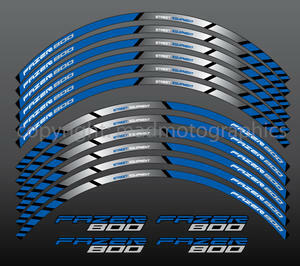 Finally they are then contour cut to shape, supplied on their backing sheet ready to apply to your bike. You can be sure these decals will last! Laminating - Why so important? We Laminate most of our prints. We use high quality flexible gloss laminating film from the German brand ORAFOL. Even if you stick them on normal every day stuff like laptop, doors, tool boxes etc., usually if they are just normally printed, the ink gets faded and scratched easily. Not talking about cars or bikes' parts, fairings and especially wheels where there is heavy friction. Now you can be sure your decals will LAST! IMPORTANT, please read before you buy! UK and most EU countries is around 7-10 working days. Rest of the world around 10-20 working days. So if you need the item to be delivered on a specific date, please don't buy. If your item is taking longer to deliver, please write us a message, we will resend it to you. If you have any issues with the item, please contact us. We will do everything to satisfy your needs. You have to login/register to send enquiry. © 2019 madmotographics.com All Rights Reserved.